You got on the phone and pushed a stock that people know, say, Dr. Pepper. But then you said, “Really, it’s my IPOs — that’s where I’m going to make you the most money.” You got the account, and then you started selling them on our IPOs — very enticing initially, but if you bought, you lost. There was no way to win. When a stock collapsed, the mentality was that even if you lost thousands of dollars you’d buy more — instead of relating to a client that it crashed, you’d say it’s trading at a discount. And it worked because everyone wanted to make money. Left untold is the story of the victims, disparaged as “garbage” by Mr. DiCaprio’s character in the movie. It is now the month of December, when the greatest part of the city is in a bustle. Loose reins are given to public dissipation; everywhere you may hear the sound of great preparations, as if there were some real difference between the days devoted to Saturn and those for transacting business. … Were you here, I would willingly confer with you as to the plan of our conduct; whether we should eve in our usual way, or, to avoid singularity, both take a better supper and throw off the toga. But these were not grandmothers we were calling on the phone. These were qualified investors, who had, basically, a gambling habit. In my mind, I just can’t imagine how some guy in Texas that’s never seen me, that’s never met me can send me $50,000. I just don’t understand how. Make sure you have an investment plan. The fiduciary generally has to consider both questions and the investor usually gives the advisor the authority to buy and sell on his behalf. The advisor with the suitability standard only has to think about the first one and has to consult with the investor, who then gives the advisor the trade order. Moreover, the advisor who is a fiduciary is subject to personal liability for the well-being of the investor should he act in an imprudent manner. Supposing that there is a highly speculative investment with high profit potential. An advisor subject to a suitability standard can call up virtually anyone and pitch the idea, because as long as it might has a place in the investor's portfolio, e.g. 0.5%, he is not breaking any laws or regulations. Philosophy: Do you have an edge on the market? If so, what is it? Process: How do you implement your "edge"? Portfolio: Does the portfolio reflect the principles outlined in the philosophy and process statements? As part of my evaluation process of your group, please outline your investment philosophy and process. Finally, take some responsibility for your money and know your investment objectives. Remember the Alice in Wonderland passage of Alice's conversation with the Cheshire Cat? If you don't have an investment plan, how will you know when you get there? For more details, I would suggest reading my previous post entitled The ABCs of financial planning as a primer on this topic. Once you've adopted these steps, you should have a much better idea of what you want; where you want to go; and better protection against the Wolves of Wall Street. I have long believed that one of the ways to nurture youth is to give them a focus in their lives, whether it be music, sports or other pursuits. This is especially critical during their adolescent years as they start to form their own identities. It's one of the key reasons why I became involved with the Vancouver Youth Symphony Orchestra Society. Participation in a VYSO orchestra teaches young musicians to focus on both their individual musical and orchestral skills. The latter is particularly important as many people can learn to play music, but a different skill is required when the conductor points to a section and have them all play the same sound at the same time. (That's why often school bands have "muddy" sounds - it's because they haven't learned orchestral skills.) It's much like the difference between learning to walk and learning to march in formation. This holiday season, I am launching my personal appeal for support of the VYSO's Margitta Krebs Bursary, named after the much beloved conductor of the VYSO Debut and Junior Orchestra who is retiring after 29 years. Margitta Krebs is celebrating her 29th season as Conductor of the Vancouver Youth Symphony Orchestra's two junior string orchestras and she will retire at the end of this season. She has now seen several generations of VYSO musicians proceed from Debut to Senior ranks and is proud to have launched them. Over the last 29 years, the Debut and Junior String orchestras have tripled in size under Margitta's enthusiastic leadership. The VYSO is excited to announce that it is founding the Margitta Krebs Bursary Fund to honour Margitta's longstanding contribution to the VYSO. The bursaries will be open to students in the Debut and Junior Orchestras and their graduates as they proceed through the Intermediate and Senior Orchestra ranks. The Margitta Krebs Bursary is intended to financially assist students who might otherwise be unable to participate in orchestral training. If you are in the Vancouver area, please come to Margitta's Farewell Concert on Sunday, May 4, 2:30pm at the Nikkei Centre in Burnaby, B.C. The Junior and Debut Orchestras, consisting of musicians ages 8-13, will close the season with a medley of the best, featuring everything from Ashokan Farewell, to an assortment of fun favourites and a stirring finale of Bach's Brandenburg Concerto No. 3. Special guest conductor for this piece will be Mr. Roger Cole, VYSO's Senior Conductor and Artistic Director. The full calendar of the VYSO's concerts this season can be found here. Please consider contribute to the Margitta Krebs Bursary Fund by clicking here. It's a sure bet that you'll feel better about yourself by supporting efforts like this to the young discipline and focus in their lives. In the wake of Friday's stock market rally, it appears that the seasonal Santa Claus rally is well under way. Rob Hanna at Quantifiable Edges produced analysis that initiating a long position in the NASDAQ Composite as of Friday's close (until December 20) and held for eight days would have been profitable in 24 out of 26 years. Further analysis shows that a long position in the SPX initiated at the close on Friday, December 13, and held for 15 days would have been profitable 25 out of 29 years. 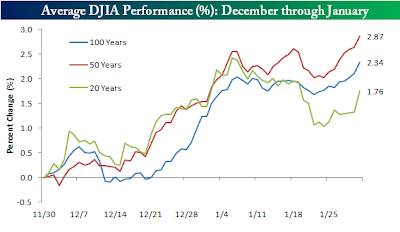 In addition, Bespoke produced analysis showing the typical seasonal pattern for the DJIA and, if history is any guide, the rally is just starting and should continue until the first week of 2014. In the past, the Dow has advanced roughly 2% from now until the first week of January. From a technical perspective, an upside potential of 2% makes sense. The chart below of the SPX shows upside potential of roughly 1850, based on the convergence of the 2 standard deviation upper bound of the weekly Bollinger Band depicted trend line. An advance to the 1850 level represents a gain of approximately 2% gain. 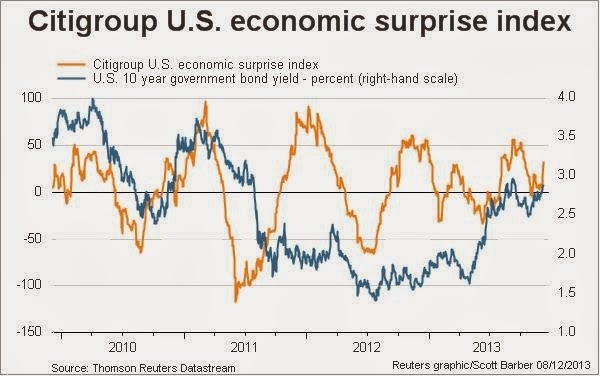 A pause in early 2014? If equity prices were to rally that much that quickly, short-term oscillators would move into overbought readings and stock prices would likely pause or correct from those levels. 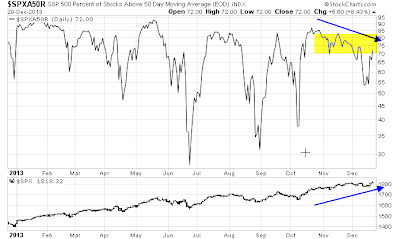 Breadth indicators have been showing negative divergences for the last few months and they paint a picture of a rally that is running out of steam. One likely scenario is equity prices pause after the seasonally positive Santa Clause rally. 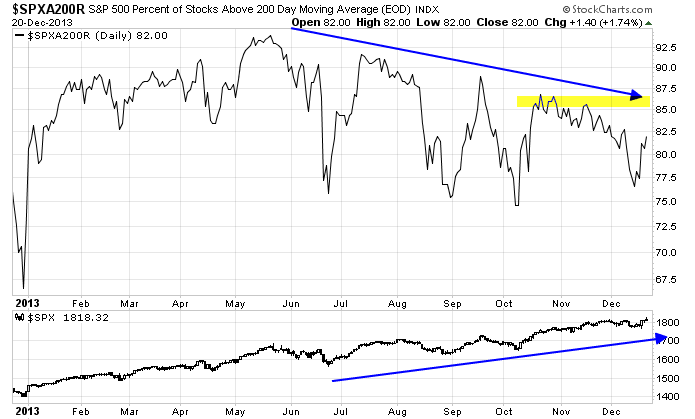 Similarly, there is a negative divergence in the number of stocks above their 50 day moving average. 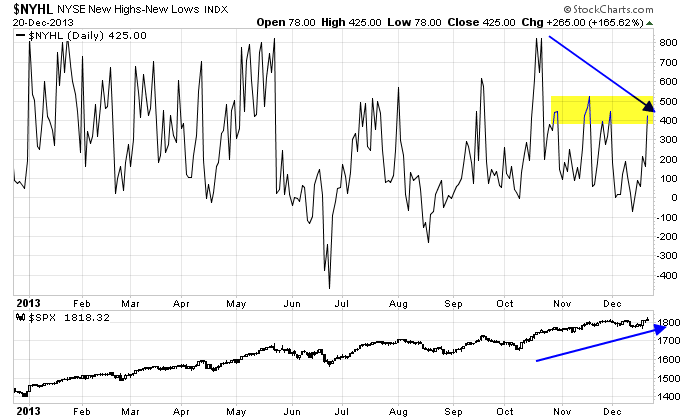 This is a sign of deteriorating breadth and fewer and fewer stocks are driving this rally. 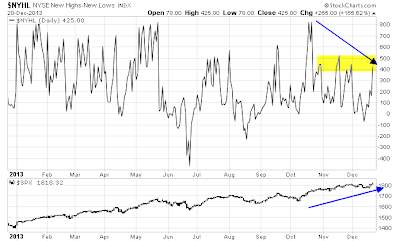 The resistance band, shown in yellow, will be more challenging for this breadth indicator to overcome as this market advances. 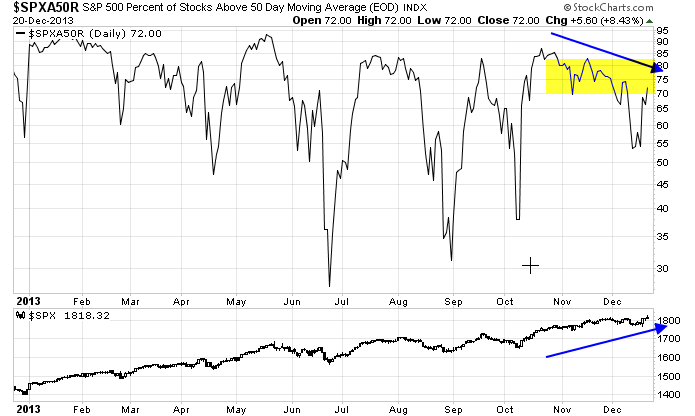 A similar pattern of deteriorating breadth can be seen in the number of stocks above their 200 day moving averages. The message from these different breadth indicators using different methodologies and look-back windows tell the same story of declining breadth. Equally disturbing for the bulls who hope that a Santa Claus rally can carry on until well into 2014 is the relative performance of the small cap stocks. As the chart below of the small cap RUT compared to the large cap SPX shows, small caps have been underperforming even as the market rallied. The failure of a high beta sector like small cap stocks to assume market leadership is a knock against the longevity of this bull move. The performance of the mid-cap stocks is also confirmation of the relative weakness of small caps. Shouldn't higher beta stocks like mid and small cap stocks be leading the market upwards if this bull phase is to be sustainable? Businesses are building their inventories of merchandise and new homes. That activity boosted real GDP during Q3, and may be doing it again during the current quarter. The question is whether some of this restocking is voluntary or involuntary. The recent weakness in producer and consumer prices suggests that some of it is attributable to slower-than-expected sales. To move the merchandise, producers and distributors are offering discounts. 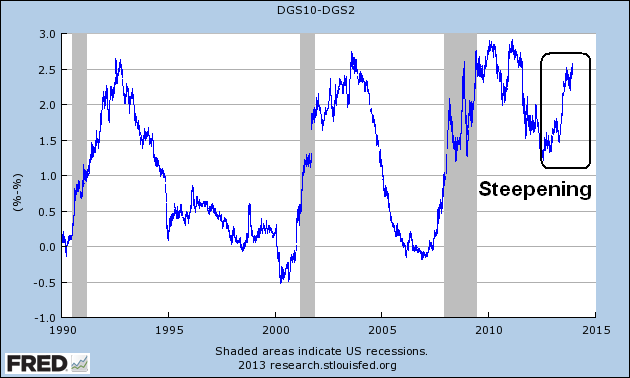 November’s surge in housing starts may also be outpacing demand, as evidenced by weak mortgage applications. In other words, the rebound in the Citigroup Economic Surprise Index over the past 10 days might not be sustainable into the start of next year. I’m not turning pessimistic about the outlook for 2014. I am just raising a warning flag given the remarkable increase in inventories recently and weakness in pricing. I had seen the strength in the Citigroup US Economic Surprise Index as a positive, because top-line growth was lacking in Q4 Street estimates, which left share buybacks and margin expansion doing most of the heavy lifting in Q4 EPS growth (see Is a Fed taper bullish or bearish for stocks?). The indication that we may see a near-term upside surprise in revenue growth is especially positive, because I had been concerned about the upcoming Q4 Earnings Season that begins in January. 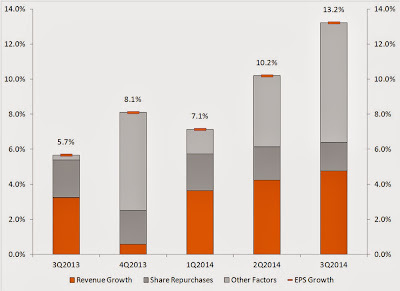 Thomson-Reuters recently deconstructed Street earnings forecasts and, as the chart below shows, consensus 4Q EPS growth depended mainly on share buybacks and "other", which is mainly margin expansion, but little or no revenue growth. However, if the rebound in the Citigroup Economic Surprise Index is illusory, as per Yardeni, then all bets are off. For now, my base case scenario calls for a Santa Claus rally into the first few days of the New Year. After that, we will have to wait for signs of continued growth from Earnings Season to determine market direction. I will be closely monitoring the Manufacturing PMI reports from around the world in the first week of January for early indications of economic strength. To be honest, I did not expect a December taper. That's because there was no consensus at the Fed as to what kind of forward guidance language to give Mr. Market so that it wouldn't freak out. The Fed had made it clear that "taper is not tightening". In light of the market reaction in the May-September period over the possibility of tapering, the Fed had to make it clear that they did not want forward rates to rise significantly. One alternative was to state that they would lower the unemployment threshold range before considering raising short-term rates, another was to explicitly target inflation, etc. There appeared to be no consensus. The Committee now anticipates, based on its assessment of these factors, that it likely will be appropriate to maintain the current target range for the federal funds rate well past the time that the unemployment rate declines below 6-1/2 percent, especially if projected inflation continues to run below the Committee’s 2 percent longer-run goal. We now have an inflation target in the guidance language, sort of. What about the risk premium? The FOMC statement had also raised economic growth and lowered unemployment projection for 2014, which is bullish for the economy and the stock market. Under conditions of rising economic growth, rising long rates should not be an impediment for stock prices because of the underlying support of rising growth and rising earnings. While that is true of a typical cyclical recovery from a recession, current conditions are unusual because it is a recovery from a balance-sheet recession where deleveraging is occurring. Moreover, the Fed's QE programs have served not only to lower interest rates, they compressed risk premiums across the board (see It's the risk premium, stupid!). So what happens now to the risk premium? Here is my concern. The response of stock prices to rising EPS is linear, while the response to changes in risk premium is non-linear. Here is what I mean. Consider that if EPS rises 10% and the P/E ratio stays the same, stock prices will rise 10%. However, if the discount rate, or capitalization rate, on expected future earnings changes by 100bp, and the change consists of a combination of rising interest rates, e.g. 25bp, and rising risk premium, e.g. 75bp, then prices can change considerably. The chart below graphically shows capitalization rate on the x-axis and the P/E ratio on the y-axis (P/E = 1/cap rate). Note how the line is depicted as a curve. A minor change in the discount rate can affect the P/E ratio disproportionately. When rates is low, a small rise in capitalization rate results in a precipitous drop in the P/E ratio. Even if EPS rises, a Fed taper whose market reaction includes rising risk premium, can result in conditions where stock prices fall because the positive effects of rising earnings are offset by the negative effects of falling P/Es. I am therefore carefully watching credit spreads, both in the US and globally, to how the market perceives the Fed's decision to taper. 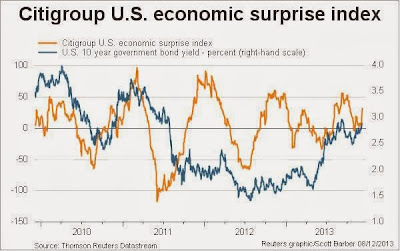 Will the risk premium rise? By how much and in what sectors? During the May-September "taperitis" period, the Fed's announcement that it was considering tapering caused emerging market bond yields to blow out and nearly resulted in an EM currency crisis. Credit Spreads are on fire or as our Spanish friends would say “en fuego”. Bank and finance paper is better by 3 basis points to 5 basis points but in the 7 year and 8 year part of the curve paper is as much as 8 basis points tighter. TMT (telecom media and technology) is 3 basis points to 4 basis points better. Stocks are rallying huge and the funds rate will be at zero for the rest of out lives and maybe even our supernatural lives. So what is there to worry about as this is financial nirvana. Here is the longer term chart of EM bonds relative to US junk. EM bonds never recovered from taperitis, which is a concern given the interconnected nature of the global financial system. Watch this space! If EM spreads were to start reversing themselves and start blowing out, then the contagion could potentially spread to other markets and the result would be a catastrophic market sell-off. Blogging will be light until the New Year, but I wanted to share my investment plan for 2014. Here is how I see US equity market conditions right now. A sweet spot for equities? Current macro conditions indicate that we are in a sweet spot for equity returns. The US economy continues to revive and it is starting to show signs of growth acceleration. Coincident indicators were generally positive, but less strongly so. Steel production is positive albeit more muted. 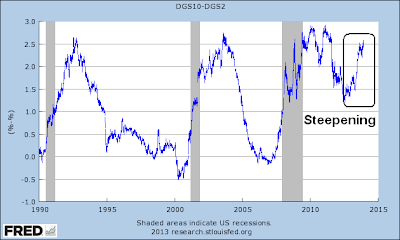 Bank lending rates remain at or near record lows. House prices remain strongly positive. Tax withholding retreated after an excellent November. Gallup consumer spending remained quite positive, despite challenging YoY comparisons, Johnson Redbook was moderately positive, but the ICSC index less so. My mantra remains the same. The economy has bounced back in the second half of this year, and all looks well for the next 3 to 6 months. Housing and especially interest rates must be watched carefully, however, as to the end of 2014 and 2015. In particular, the bond market's reaction to the inevitable Fed tapering, whenever that occurs, has to be watched very carefully. Will long rates start to back up and push up mortgage rates and dampen growth in the cyclically sensitive housing sector? Meanwhile, European leading indicators are still pointing up, though coincidental indicators still look punk. The ECB has made it clear that it is prepared to give the market a Draghi Put, which is supportive of growth. China is growing, albeit in an unbalanced fashion. Simply put, global growth is continuing and there is little or no tail risk in the immediate future. It's time to get long equities. What could possibly go wrong? Maybe it's because I apprenticed under people who lived through the terrible bear market of 1974-75 that I worry so much, but I have this nagging feeling that these market conditions are too good to be true. According to the Stock Traders Almanac, the two first years of the four-year cycle are usually the worst with the last two usually the best. Bear markets usually occur during the first two years. Since 2013 (the first year of this term) was so strong, historical odds for 2014 (the second year) to suffer a downside correction are pretty high. Chart 1 overlays four-year cycle lows on the SP 500 going back to 1990. The vertical bars show the last six bottoms occurring in 1990, 1994, 1998, 2002, 2006, and 2010. Earlier four-year patterns (not shown here) occurred in 1970, 1974, 1982, and 1987 (the cycle skipped 1978 while 1987 was a year late). Most of those bottoms took place during the second half of those years (mainly around October), and have coincided with midterm congressional elections. 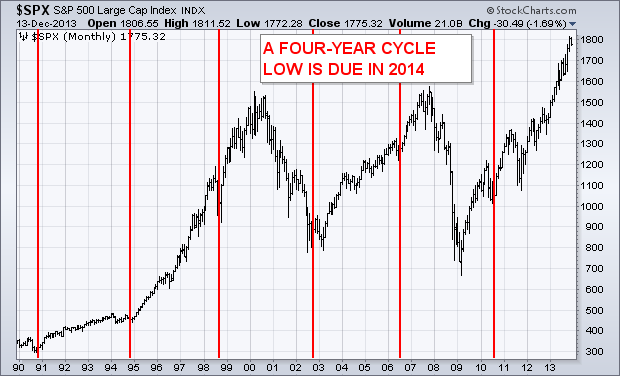 Assuming the four-year pattern repeats, the next bottom is due in 2014 and most likely during the fourth quarter. That carries both good and bad news. While the second year of a presidential term (like 2014) is usually the weakest, the third year (2015) is usually the strongest. 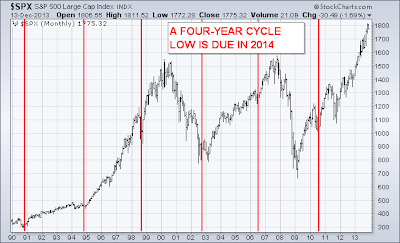 The bad news is that 2014 is likely to experience a major stock correction. The good news is that correction should lead to a major buying buying opportunity later in the year. To be sure, the market may resolve its current critical juncture by headed higher rather than turning down. Yet Aronson notes that other indicators are also flashing caution. [Buffett] noted that the equity market was fairly valued and stocks were not overvalued. Specifically, Buffett said “They were very cheap five years ago, ridiculously cheap,” and “That’s been corrected.” He also noted, “We’re having a hard time finding things to buy.” One has to take note when the world’s most high profile investor (a long investor), cannot find stocks to buy although he reports his business is improving. This is a case of watching what Buffett does, not just what he says. When he says that he can't find anything to buy, you have to start getting cautious. When both Growth (VLMAP) and Value (Buffett) are cautious, then investors have to get especially wary. ...but longer term indicators, such as valuation (VLMAP and Buffett) and longer dated economic indicators (New Deal Democrat), are flashing caution signs. So markets rally for now, but watch out as we approach late 2014. My base case scenario calls for stock prices to continue to grind upwards until mid-2014, at which point some unknown catalyst is likely send equities downwards. Some time during Q2 and Q3, I would have to re-evaluate the macro conditions and re-position portfolios accordingly. Today, the VIX at levels that are low by historical standards, indicating that the price of downside put protection are relatively cheap. Investors should consider staying long equities today but starting to accumulate cheap put protection into mid-year. 2014 is sounding like a good year to be selling in May and go away. In my last post (see Is a Fed taper bullish or bearish for stocks? ), I outlined a cautiously optimistic growth outlook for the American economy. In another post (see More reasons to buy Europe), I outlined a bullish scenario for Europe. While these two major regions in the world appear to be recovering nicely, the elephant in the room that no one wants to talk about is China. There is no question that China's rate of growth has been slowing for the past few years. Mr. Market has been showing his concern as well. My framework for analysis is the relative return of the country market ETFs of China and its major trading partners against the MSCI All-Country World Index ETF (ACWI). That way, all returns are denominated in USD and therefore any exchange rate effects are neutralized. Here is EWH, or the Hong Kong ETF, against ACWI. While the relative downtrend is less pronounced and EWH is approaching a relative support level, the relative trend nevertheless remains down. The relative returns of EWT, the Taiwan ETF, tells a similar story of multi-year underperformance. Here is EWY, or the South Korea ETF, against ACWI. It's not a pretty picture, but you get the idea. The most alarming relative return chart of the region belongs to EWA, the Australia ETF. It recently violated a major relative support area, with little signs of relative support below. I interpret this as Mr. Market telling us that the era of Chinese infrastructure-led growth, which stimulated outsized commodity demand, is over. The risk for the global economy is that a slowdown in China, if not properly managed, has the potential to turn into a crash landing. Given the financial linkages that exist around the globe, the financial contagion from a Chinese crash landing would likely spread around the world and create another Lehman or Creditanstalt style event. Fortunately, silver linings are starting to appear. From a short-term technical viewpoint, the Shanghai Composite managed to stage a rally through a downtrend. This may be the early signs of stabilization. In order to achieve its stated goal of re-focusing growth from export and infrastructure to the consumer, the authorities would have to stop, or at least lessen, the financial repression of the household sector with higher wages and interest rates for household savings. All those steps would hurt the interest of the Party insiders who got filthy rich. If China's top leadership really wanted to signal the seriousness of its intention of re-balancing growth and market based reforms, maybe what it needs is a Night of the Long Knives, which refers to an event in 1934 when Adolf Hitler instituted a purge of his enemies. One of the victims of the purge was the SA, otherwise known as the brown-shirts, because they had outlived their usefulness. Maybe what China needs is its own purge of Party cadres, because they have outlived their usefulness and become an impediment to stable long-term growth. [E]very country that has experienced a growth miracle has also developed imbalances that had to be reversed, and the adjustment process is simply the process by which these imbalances are reversed. China is no exception. In order to rebalance the Chinese economy we must move from a period during which the elite received a disproportionate share of growing Chinese wealth to one in which ordinary households and small businesses receive a disproportionate share. After thirty years during which Chinese households retained an ever smaller share of the rapidly growing Chinese economy, doing nonetheless very well in the process, we must shift to a period during which ordinary Chinese households receive an ever rising share of a more slowly growing Chinese economy, in fact this is almost the very definition of rebalancing in the Chinese context. History has a lot to teach us about this process, and it has a lot to teach us about which countries were able to manage the difficult adjustment in ways that created a basis for long term success and which countries were not able to do so. China’s leaders have already demonstrated sufficient foresight and ability to have managed the growth period successfully, and we have every reason to hope that they will manage the adjustment process equally well. But there should be little doubt that thirty years of astonishing growth was the relatively easier part, and that President Xi Jinping and Premier Li Keqiang face a greater challenge than that faced by their predecessors. And there should also be little doubt that the recent political turmoil in China is not an accident. History makes it very clear that the next ten years will be a political challenge for China even more than it will be an economic one. [A] successful adjustment in China actually requires that China move temporarily “backwards” towards greater centralization of power and a tighter grip on decision-making by President Xi and his allies. After all it took Deng Xiaoping to unleash the radical reforms of the 1980s, and it is an open question as to whether he would have been able to do so had political power in China been as dispersed in the 1980s as it is today. In that sense what seems like an attempt by President Xi to consolidate power more tightly within a small group is perhaps not a step “backwards” in political liberalization but more of a temporary retreat in order to ensure a successful adjustment, which itself might be a precondition to further political liberalization some time in the future. Zhou Yongkang, China's former security chief, has been placed under house arrest while the government investigates him on charges of corruption and "violating party discipline." He's the most powerful politician to go down since the Communist party took over in 1949, and his arrest is more evidence that President Xi Jinping is embracing authoritarianism in a big way. Think of Zhou's arrest like the President taking down the retired head of the FBI or the CIA. The difference in China, though, is that those two security apparatus' are controlled by the party, and within the party, Zhou still had a great deal of influence. He's a former members of the Politburo Standing Committee (the 7 to 9 men that run the country) and in arresting him "Xi has broken with an unwritten understanding that members of the Standing Committee will not be investigated after retirement," writes the South China Morning Post. This is a key development that suggests that President Xi Jinping is consolidating power. In all likelihood, the purges will spread and the markets may freak out over the prospect of political turmoil in China. Should the markets sell off because of these political developments, it could be a buying opportunity. I agree with Pettis that some measure of authoritarianism (think Singapore) and power consolidation may be necessary for China to move ahead to the next phase of growth. Such political developments should be viewed in a bullish, rather than bearish, context. Is a Fed taper bullish or bearish for stocks? There is no question about it, last week's US high frequency economic releases tilted heavily to the positive side. The NFP biggie came in ahead of expectations, as well as a whole host of other numbers. Not surprisingly, the Treasury yield curve has steepened accordingly. The graph below shows the difference between the 2s and the 10s, which bottomed out in 2012 and has been steepening for most of this year. These developments that point to an improving economy should be equity friendly. Ed Yardeni encouragingly pointed to his analysis showing how changes in Manufacturing PMI tend to lead aggregate revenues for equities. While he expressed some doubts over the recent M-MPI spike, he did allow in later posts (see here and here) that a growth acceleration was real. If we do seen an upside surprise in revenues, then stocks prices could soar because of better than expected Q4 EPS. How does the Fed react? These signs of a growth acceleration begs the BIG QUESTION. How does the Fed react in the face of thes signs of growth acceleration? No doubt, tapering will be on the table at the December FOMC meeting (though Fed watcher Tim Duy thinks that a December taper is premature). Regardless, the question of a taper is only a question of when, not if. However, Ben Bernanke, Fed governors and regional Fed Presidents have mostly been emphasizing the message that "tapering is not tightening", especially when the markets freaked out during its May-September bout of "taperitis". One idea under discussion is to lower that unemployment threshold from 6.5%, which could mean keeping rates down longer. Fed staff research suggests the economy and job market might grow faster, without much additional risk of inflation, if the Fed promised to keep rates near zero until the unemployment rate gets as low as 5.5%. Goldman Sachs economists predict the Fed will lower the threshold to 6% as early as December and reduce the bond-buying program at the same time. Does the Fed give the market some sugary syrup to help the tapering medicine go down? (See discussion above about the unemployment threshold). How does emerging market bonds and currencies react? The second consideration is especially important as the last round of "taperitis" almost sparked an emerging market currency crisis as the prospect of QE withdrawal pushed up global risk premiums (see It's the risk premium, stupid!). The chart below of the relative performance of EM bonds against US high-yield bonds, i.e. junk vs. junk, indicate that EM bonds have not really recovered from that episode and could be at risk should the markets react and push global risk premiums higher. I am therefore watching the EMB/HYG pair, as well as the performance of CEW, which is the EM currency ETF carefully for signs of global contagion from a Fed taper. The mere mention of Federal Reserve tapering can pressure various emerging markets currencies, but two could be especially vulnerable when the Fed finally does pare its bond-buying efforts. The Indonesian rupiah, already this year’s worst-performing emerging markets currency, and the Brazilian real are J.P. Morgan’s picks among developing world currencies that are vulnerable to Fed tapering. “The risk is [even] higher for expensive currencies. Both BRL and IDR are overvalued versus their 10 year average REER,” Barron’s reported, citing the bank. The EM elephant in the room is China. A Fed taper has the potential to topple China into a global financial crisis that drags down the global economy. Here's why. Consider that the RMB is pegged the the USD and it has been appreciating slowly against the Dollar. Also consider the fact that Chinese government 10-year paper is yielding around 4.5% while US Treasury 10-year is about 2.9%. What would a trader do under these circumstances? Supposing you saw paper denominated in a currency pegged to the USD (but steadily appreciating) has a yield significantly higher than Treasury yields. Isn't that an open invitation to a carry trade? Fortunately for the world, the RMB is not a freely convertible currency. Otherwise we would see every hedge fund piling into that trade and levering their exposure up 10 or 20 times and creating incredible global systemic risk. The main participants who are getting into that trade right now are Chinese companies that export and manipulate transfer pricing between their onshore (Chinese) entity and their offshore subsidiaries. Nevertheless, the exposure could be considerable and a Fed taper would be a signal to start the unwind of this carry trade. When the markets start to unwind a carry trade that is highly levered, the results are never pretty. While I am not forecasting that such a catastrophe will happen, I am allowing for that possibility and watching market developments carefully. Viewed in isolation, rising corporate revenues and a steepening yield curve in response to an improving economy are equity bullish factors. Investors, however, have to realize that they live in a global economy and they need to watch for the global effects of Fed actions. 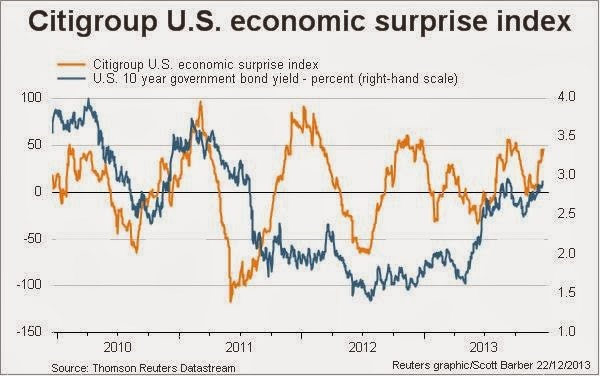 Will the Fed be successful in convincing the markets that "tapering isn't tightening"? Does "not tightening" mean that risk premiums will rise, or when they remain compressed at current levels? My best guess right now is that the Fed will be moderately successful in its messaging and US stock prices will continue to grind higher into 2014. However, I am acutely aware of the risks involved and therefore watching carefully the Fed's actions and how EM bonds and currencies react. In a future post: I will discuss the fly in the ointment to the growth scenario. Further to my last post that made the case for buying European small cap stocks (see How to stretch the Santa Claus rally into 2014), I came across further analysis supportive of my bull case for Europe and European small cap stocks. When talking about the financial sector and how they have been able to take advantage of QE to re-capitalise their damaged balance sheets, it ought to be said that QE has effectively allowed banks to ignore their underlying problems. QE has become a life support machine for the financial sector at virtually no cost to them but at a significant cost to the rest of society. That cannot go on ad infinitum. At some point in the not so distant future it will be financial reckoning day for the sector which bodes particularly badly for the European banks, most of which are way behind their U.K. and U.S. peers in terms of cleaning up their balance sheets. The IMF provided some very granular information on the state of European banks in their most recent Financial Stability Report. More than 50% of Spanish companies with loans in Spanish banks have an interest coverage ratio of less than one. In other words, the EBITDA of over half of all Spanish corporates does not even cover their interest expense (you would expect a healthy corporate borrower to have an interest coverage ratio of 3-5 times depending on the nature of the business). What's worse, the situation in Italy and Portugal is only marginally better. All of these problems have been largely ignored since the ECB stepped in with their brand of QE about two years ago and saved the European banking sector from a complete meltdown, but few, if any, of the underlying issues have yet been addressed. I recognize that Jensen was trying to point out the futility of the ECB's QE programs and the precariousness of the system even after all this central bank intervention. No doubt, a high degree of apparent systemic risk exists. If the ECB has demonstrated that it intends to supply the market with a free put option, then why not take it and go long? Indeed, the relative performance of European financials look constructive in light of the ECB's free put. The chart below of the relative returns of Financials show that their relative performance bottomed out in late 2011 and the sector has been in a relative uptrend since the summer of 2012. Despite the softness in European equities in the last few days, the underlying environment still calls for a risk-on stance in European equities. My last post highlighted the upside potential in European small caps (see How to stretch the Santa Claus rally into 2014). 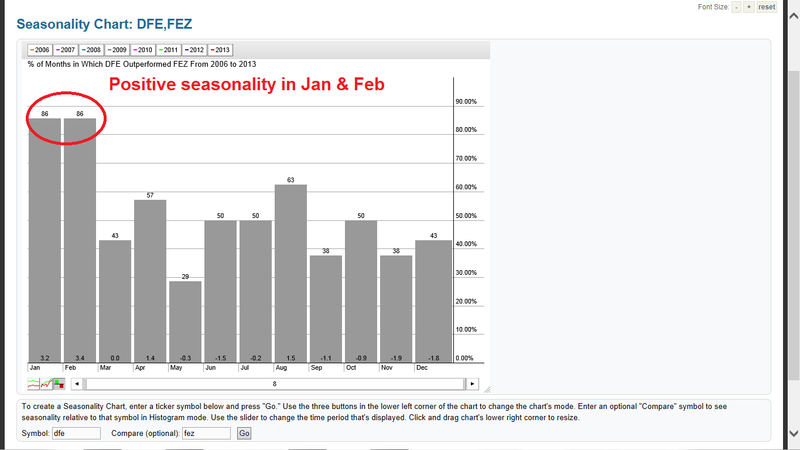 The chart below shows the relative performance of DFE (European small cap ETF) against FEZ (European large cap ETF). There are two takeaways that are encouraging for the bull case in European stocks. First, high beta small caps remain in a relative uptrend against large caps. Second, small caps are still outperforming despite the recent sell-off. The combination of a free ECB put and positive small cap outperformance in the face of weakness are suggestive of further gains in European stocks. Any weakness is likely to be a temporary pullback and should be viewed a buying opportunity. I would be inclined to focus on sectors and groups showing a high degree of leverage to a recovery, such as European financials and small cap stocks. There is one version of the Santa Claus rally that enjoys strong historical support: the last five trading sessions of December and first two of January. This year, for example, a trader wishing to capture this rally would buy stocks as of the close on Dec. 23 and sell them at the end of the trading session of Jan. 3. Traders have been aware of this particular version of the Santa Claus rally at least since 1972, which is when the editors of the annual Stock Trader’s Almanac say they discovered it. 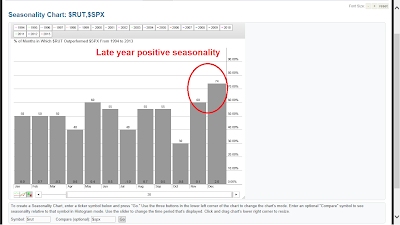 Norman Fosback, editor of Fosback’s Fund Forecaster and former president of the Institute for Econometric Research, says that seasonal patterns in large-cap stocks have “receded in significance” in recent years. Unfortunately, the smallest-cap stocks for which seasonal patterns remain the strongest also tend to have the highest bid-ask spreads. These “microcap” stocks — a loosely defined category that contains issues that are even smaller than the small caps—tend to range in size between $100 million or so and $1 billion in total market value. Fosback nevertheless favors the microcap category for the seasonal portfolio he recommends to clients, though not by buying and selling individual stocks. Instead, he prefers the iShares Micro-Cap ETF, with an expense ratio of 0.72%. The fund replicates the performance of the smallest 1,000 stocks in the Russell 2000 Index RUT +0.14% ; the average market cap of the stocks it owns is $420 million. 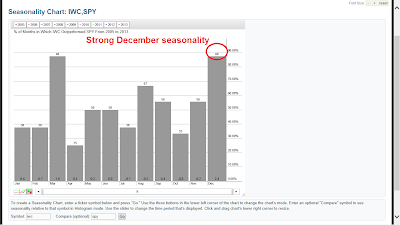 However, there may be a way of extending the positive effects of small cap seasonality well into the New Year. I discovered that European small caps have a tendency to outperform in both January and February. The chart below shows the relative return pattern of DFE, which is an ETF representing European small cap stocks, against FEZ, which is an ETF representing eurozone large caps. The relative returns of DFE against FEZ show that European small caps remain in a multi-year relative uptrend compared to large caps and the trend is supportive of further small cap outperformance. In addition, there appears to be strong fundamental support for European equities. Thomson-Reuters analyzed the consensus implied forward EPS growth rates compared to the Starmine (smart analyst) estimates and found that the Starmine estimate for Developed Europe is 6.0% compared to the market implied estimate of 0.6% - a considerable spread. By way of comparison, the equivalent figures for North American is a Starmine growth rate of 8.0% compared to a market implied growth rate of 6.1%. While the spread is positive, this analysis suggests that the opportunity is better in Europe. Under these circumstances, I would be more inclined to focus on European small caps as they tend to be more exposed to the local economies than the large caps, which has a relatively large weighting in global companies such as BMW, SAP, EADS (Airbus), pharmaceuticals, luxury goods makers, etc. Will the ECB provide a tailwind for small caps? The European Central Bank is considering a new long-term liquidity operation available only to banks that agree to use the funding to lend to businesses, a German newspaper reported on Wednesday, citing sources. ECB President Mario Draghi and other Governing Council members have repeatedly mentioned the option of conducting more liquidity operations, or LTROs, to help the fragile euro zone economy and ensure the flow of credit to the private sector. The ECB extended more than one trillion euros ($1.36 trillion) of cheap three-year loans to banks through two long-term refinancing operations in late 2011 and early 2012. But this time, an option under consideration is that the banks would have access to funding via the LTRO only if they agree to pass on the money in loans to industrial, retail and services businesses, Sueddeutsche Zeitung reported on Wednesday. The new LTRO could also run for only nine or 12 months, the paper said. In conclusion, traders who want to play the small cap Santa Claus rally may wish to rotate from US small caps into European small caps in the New Year..The combination of positive seasonality, undervalued growth potential and possible ECB support for SMEs suggests that European small cap stocks are likely to see a tailwind heading into 2014.